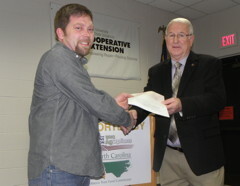 2015 WNC AgOptions recipients include: Sylva vegetable farm expanding to 60 acres, including tracts in Asheville; 50-acre USDA Certified Organic farm in Cherokee County using innovative weed control tool; Boone ginseng grower with large-volume aspirations; and Marshall sheep dairy farmer unique to region. MILLS RIVER, N.C.—Western North Carolina farmers are gaining much-needed support in diversifying or expanding their operations this year, helping some grow to a whole new level. WNC Agricultural Options presented 31 farm businesses a total of $168,000 in grants on Thursday at an event at the Mountain Horticultural Crops Research and Extension Center in Mills River. Six of the farm businesses received $3,000, and 25 received $6,000. The N.C. Tobacco Trust Fund Commission is the exclusive financial supporter of WNC AgOptions, which helps farmers offset the risk of trying new ventures. “Western North Carolina farmers are very resourceful and have proven time and time again that these grants can make a significant impact on their farming operations,” said Bill Teague, Chairman of the N.C. Tobacco Trust Fund Commission. Steven Beltram of Balsam Gardens is expanding his vegetable production in a big way, while transitioning to USDA Certified Organic so he can sell to large volume buyers and distributors. Since 2008, Beltram has farmed in Sylva, where he will be growing from 5 to 15 acres. He also recently acquired 33 acres on Sand Hill Road in Asheville and entered an agreement with the City of Asheville to rent 11 acres near East Asheville’s Azalea Park. With his grant, Miller is purchasing a unique finger weeder tractor implement that can be configured for either bare dirt or plastic mulch cultivating. This tool helps with in-row cultivation, the last stage of weed control, which can be difficult depending on the size and shape of the crop. The KRESS plastic finger weeder just recently became commercially available in the United States. Travis Cornett of High Country Ginseng is expanding sales of his product to a new level. He is constructing a drying, cooling and storage facility to increase production capacity so he can fill all the orders for seeds, rootlets and roots that he receives. He said that no other ginseng grower in the state is large enough to respond to the demand. In 2008, Cornett started planting ginseng on his land, inspired when he noticed fewer and fewer ginseng plants in the Appalachian woods. 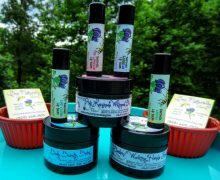 Since then, he has begun teaching others how to grow it and plans on collaborating to collectively process and market large quantities of the product. “I think ginseng is an extraordinary part of our Appalachian mountain heritage and am thrilled with the possibility of making a full-time living at it and educating others on this increasingly rare plant,” Cornett said. 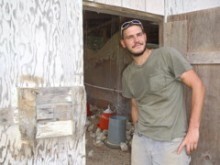 Andrea Van Gunst and Tim Gallaugher of Down to Earth Farm, WNC AgOptions recipients in Madison County, also believe in the big potential for their product: sheep milk. They are building a small-scale Grade B dairy parlor to sell milk to cheese-makers. Van Gunst expects sheep’s cheese milk, which is easily digestible, naturally sweet, and high in butter fat, to generate wide interest among the many food connoisseurs in the region. She said there is a clear argument that a sheep dairy is a farm enterprise that many more people should consider. Since 2004, WNC AgOptions has awarded nearly $2 million to 423 farm projects. “The funding provided to these projects combined with the educational opportunities have been invaluable tools in helping transform and sustain a viable agricultural industry in western North Carolina,” said Ross Young, Madison County Extension Director and WNC AgOptions steering committee leader. WNC AgOptions plans to distribute $172,000 to farmers in 2016. Interested applicants should check www.wncagoptions.org this summer for announcements about details on how to apply. Winning recipients clearly show in their applications how the grant-funded projects can increase profitability of their businesses. The administrator of WNC AgOptions is WNC Communities, a non-profit organization that has been supporting agriculture in the region since 1947. WNC Communities provides a unique forum for leaders in western North Carolina to carry out innovative programs to improve the quality of life for rural communities and to enhance the agriculture economy. See http://www.wncagoptions.org/2015-topics/ to view a full list of recipients with links to descriptions of the projects.